Football is part of our national fabric. Football is tailgating, Uncle Roys annoying game commentary, and an excuse to watch television for ten hours straight every weekend, but its also a dream. Football could never be just a sport. It has changed lives and inspired success in monumental ways. It has created bonds, even unexpected ones (such as the friendship between former Alabama quarterback A. J. McCarron and young fan). But even football has its shadows. The sport is a violent one, to the simultaneous joy and horror of players and fans alike. Footballs dangers have loomed over the sport for over one hundred years, but they have not destroyed it. From the 1880s to the 1920s, college football struggled to balanceits meteoric rise with its growing brutality. Today, both college and professional football are facing this challenge again. Modern concerns over concussions and long-term effects of a career on the field are becoming more severe and apparent. Is this issue the start of footballs demise? To understand todays issues, we needed to understand the first turning point in the history of our nations favorite sport. Thomas McClung and William “Pudge” Heffelfinger posing on fence in football uniforms. McClung captained the 1891 football team which had a 13-0 record and outscored its opponents 488-0. Yale athletics photographs, ca. 1850-2007 (inclusive). Yale University. Violence has always made American football distinct from other sports. In the nineteenth century, college students combined rules of soccer and rugby. The resulting game was a new form of hazing, an acceptable way for older students to demonstrate their power over younger ones. The first official football game was in 1869 between Princeton and Rutgers, but it was played by English Rugby Union rules. As football gained prominence across universities, Princeton, Harvard, Yale and Columbia convened to define some universal rules based these guidelines. The newly formed Intercollegiate Football Association created the first official football rules in 1876. Out of sixty-one original rules, only two dealt with the safety of players. 57. No hacking or hacking over or tripping up shall be allowed under any circumstances. 58. No one wearing projecting nails, iron plates, or gutta percha on any parts of his boots or shoes shall be allowed to play in a match. Future meetings continued to ignore fouls and safety, but they gradually shaped the rules of modern football. In 1888, two new rules forever changed the nature of American football: players were allowed to block the ball carrier and they were permitted to tackle below the waist. Why so popular? The answer is simple: football is manly. Today, fans that watch men crush each other on television are only interrupted by commercials of men drinking beer and Peyton Manning telling them to just rub some dirt on it. The men of the Progressive era would have heartily approved. For most players and fans, footballs violence was not a detractor but a benefit. Football was how young men to demonstrate their manliness to each other and how they would learn the skills necessary to take on the dynamic turn-of-the-century climate. Theodore Roosevelt, Jr. as a football player at Harvard; being helped off the field after an accident. Theodore Roosevelt, Jr. approx. 1905. From: Theodore Roosevelt Collection photographs: family portraits. Provenance: Purchased by the Roosevelt Memorial Association from Rauscher, 1925 December 7. Harvard University. Alternate Title: [Harvard football players demonstrating illegal strike photograph, ca. 1901]. Harvard University. Dept. of Athletics, n.d. Harvard University. Football stars became the new soldiers. By the end of the nineteenth century, the American Civil War was a highly glorified event in popular culture. Many young men who played football had fathers or grandfathers who fought in the war and they were determined to have their own shot at heroism. Football was easily related to war. Players could similarly put their bodies on the line for victory, execute tactical plans, wear armor (a popular name for padding), and play to fight songs based on Civil War marching tunes. The University of Virginia even played in silver grey and cardinal red to represent Confederate uniforms stained with blood, until the colors were changed to blue and orange in 1888. In this cartoon, below, a Spartan mother tearfully sends her boy off to college, which, due to football, was now the same as sending him to war. Illustration shows a scene at the front door step of a house, with a young man headed for college, he is wearing a sweater with a large “Y” on it and is carrying a suitcase labeled “Harold Halfback Yale” and a football; his sobbing mother hands him a football helmet and shoulder-pads, and a little girl hands him a “First Aid Kit” and shin-guards. Even the dog is crying. Caption: The Spartan Mother Go, my boy! When duty calls. September 24, 1913. Prints and Photographs division. Library of Congress. Theodore Roosevelt Digital Library. Dickinson State University. Some members of the public, like the artist of the cartoon below, believed that football stardom became so disproportionately admired that when the United States did have active-duty soldiers to honor during the Spanish-American war, football players still received greater admiration. Men were not the only ones who approved of a little brutality. Though football has largely remained an all-male game (though there are exceptions, such as the Womens Tackle Alliance), some of the proudest fans have been women. Football wasnt just an opportunity for players to gain respect of their fellow men. It was a chance to gain the admiration of the young women and assert ones manliness during an era where women severely challenged traditional masculinity. During the same period football gained its foothold in Americas colleges, women demanded voting rights in larger, more successful efforts than ever before (eventually succeeding in 1919). Just like men on the football field, women were locked in a cultural, social and political contest against gender discrimination and the Victorian-era definitions of femininity. Like football, it was a brutal game. Popular media, such as the cartoon below, depicted these new, young women as calloused admirers of footballs violence, to the horror of older generations. Though women were avid supporters, football kept women in the role of spectators. Camp diligently collected surveys and data from former players and medical professionals to publish a public defense of football in 1894. Football Facts and Figures laid out a variety of opinions and statistics to defend football and, most particularly, its safety. One compilation of statistics for injuries to the head was drawn from a survey of roughly 150-200 former players, primarily from Yale, Harvard, Princeton and Wesleyan. Injuries became and expected and, perhaps, part of the games appeal. Few officials meant late hits, helmets and padding meant players could launch themselves at others to tackle harder, lack of free substitutions meant targeting the knees of star players, and adrenaline meant full out fist fights in the middle of games. Roosevelts own son, Ted, hurt his collarbone and tooth while playing for Harvard. In 1893, President Grover Cleveland suspended the Army-Navy rivalry game after a report revealed that 24 players had been hospitalized and dozens more had to sit out following practices (and the popular story that two officers in the stands challenged each other to a duel). Until they were banned, mass plays like the infamous flying wedge demanded intense pushing and pulling and created extremely dangerous situations. President Roosevelt watching the Army and Navy football game in Philadelphia, Nov. 30, 1901. From: Thomas Collier Platt photograph album of Theodore Roosevelt (Roosevelt R500.P69a). Harvard University. Players were easily able to bend rules. The addition of more and more complex rules from the Intercollegiate Football Association (followed by the Intercollegiate Athletic Association in 1905 and then the National Collegiate Athletic Association in 1910) made officiating extremely difficult. Schools began to complain about the number of uncalled fouls. Harvard argued the team that plays a gentlemanly game against one playing an unfair game will always be beaten and the university banned football in 1885. By 1887, the rules were changed to allow two referees on the fieldone to watch the ball and the other to watch the playersbut it was not enough. That same year, Roosevelt summon six prominent football figures, including Camp, to the White House so they could discuss and agree to play a more gentlemanly game. All the participants signed a statement that they would play fairly, but the ferocity didnt end. Injuries were one thing, but deaths were another. While football may have had some of the trappings of war, no one approved of casualties. Few things caused more outrage than the realization thatyoung men were dying for public entertainment. In the 1905 season alone, nineteenth people died playing football. In a tamer fashion than Mosby might have wanted, the President of the University did not ban football but instead asked for reform at the next meeting of the IAA. 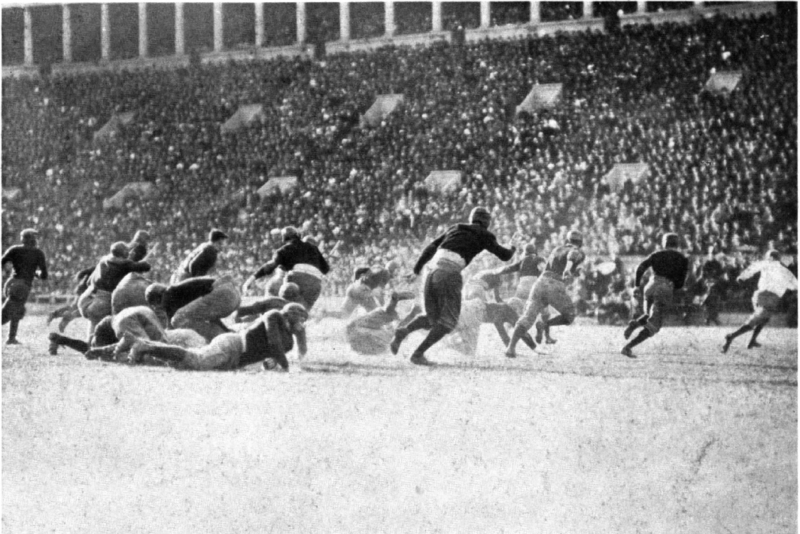 The IAA banned hiking the ball carrier and approved Virginia athletic director William Lambeths proposal to divide the game into quarters and allow a long halftime break. The field where Christian suffered his fatal injury is now known as Lambeth Field. Some schools were not satisfied with mere reform. Deaths threatened to end football permanently in many communities. In October 1897, University of Georgia player Richard Von Albade Gammon died after receiving a severe concussion in Atlanta during a game against the University of Virginia. Georgia disbanded its team and, just days after Gammons death, a law that would ban football from the state began to move through the state legislature. In this spirit, football has prevailed despite the danger. The love of the game has long outweighed the potential consequences of participating for many players, coaches, families, and fans. Though football was banned at other colleges, such as University of Alabama, Wake Forest University, University of Tennessee, Trinity College (now Duke University), and numerous others in its early years, it always came back. Today, football is still on the defense. It may be unbelievable to think that a sport that makes millions and billions on both the amateur and professional levelcould ever be in trouble, but people are beginning to again ask: is it worth it? We now have strict rule enforcement (todays games have seven different officials on the field and, in some instances, video replay), state-of-the-art gear, and vastly improved medical knowledge, but serious and permanent injuries are still rampant. While deaths are thankfully an increasingly rare occurrence, they still haunt the game. As recent as 2005, Arena Football League Los Angles Avengers player Al Lucas died after blunt force trauma to his spinal cord. Every person who has ever watched or played football has experienced that terrifying, breathless moment while they wait for a prostrate player on the field to move. These persisting problems have lead to a serious crisis in the sport. One of the most prominent debates concerns concussions and the lasting impact they have on players even after they have retired from the game. Some research has linked the type of contact and injuries common in football to brain damage and degenerative diseases. Though a lot of research is still in progress, many former players believe they are walking evidence of footballs dangers. As of July 2014, over 4,5000 retired NFL players are currently attempting to finalize a $765 million dollar settlement with the League for inadequate treatment and discussion of concussions. This settlement could affect close to 20,000 former players and their families. Former NFL player Howie Long, who now has two sons in the NFL, believes that improved awareness and proper training will help prevent the long-lasting effects of football that he sustained. Other players, like Tom Brady, Kurt Warner, and Bart Scott, have either flat-out forbidden or expressed reservations about letting their children (or future children) play football. Former NFL player Terry Bradshaw recently announced that he wouldnt let his son play football. This is the most alarming situation to many football fans. If footballs greatest heroes are putting their foot down, what will everyone else do? The possibility that parents will start to forbid their children from playing football in fear of their safety, would whittle away the sports foundation. College and professional football has been forced to respond and forced to reform. Commissioner of the NFL, Roger Goodell, spoke at the Harvard School of Public Health in 2012 about the positive role of football and the NFLs commitment to safety, below. He noted that football has always had its challenges in safety just as it has always required leaders willing to reform it (including Roosevelt and his 1905 meeting). NCAA and the NFL have launched campaigns to prove their dedication to safety, especially to the parents of future football stars. Last August, the NFL invited 30 mothers of young football players to a roundtable on sport safety and invited mothers to attend (and participate in) a safety clinic hosted by Ohio State University. For its popularity, football has had a relatively short history but an extremely dynamic one. Football is not the only dangerous sport, but its identityboth positive and negativehas always been strongly linked to contact. Today, we struggle with similar challenges as Roosevelt, Camp and others did one hundred years ago. How do we protect players without destroying the game we love? About the author: Christina Regelski has Bachelors degrees in History and Archaeology from the University of Virginia and a Masters degree in History from George Mason University. She will begin her Ph.D. in History at Rice University in August 2014, where her work will focus on race, gender and material culture in the eighteenth and nineteenth-century American South. Christina has a background in museum education and she is passionate about public history and digital history. Christopher C. Meyers, Unrelenting War on Football: The Death of Richard Von Gammon and the Attempt to Ban Football in Georgia, The Georgia Historical Quarterly 93.4 (2009), 389. Meyers, Unrelenting War on Football, 389. David L. Westby and Allen Sack, The Commercialization and Functional Rationalization of College Football: Its Origins, The Journal of Higher Education 47.6 (1976), 630. Letter from Theodore Roosevelt to Leslie M. Hagen. [February 3, 1903?] Theodore Roosevelt Papers, Manuscripts division. The Library of Congress. http://www.theodorerooseveltcenter.org/Research/Digital-Library/Record.aspx?libID=o184095. Theodore Roosevelt Digital Library. Dickinson State University. Walter Camp, ed., Football Facts and Figures: A Symposium of Expert Opinion on the Games Place in American Athletics (New York: Harper & Brothers Publishers, 1894), 46-57. To learn more about gender and its role in war at the end of the century, see Kristin L. Hoganson, Fighting for American Manhood: How Gender Politics Provoked the Spanish-American and Philippine-American Wars (New Haven: Yale University Press, 2000). Pettegrew, Brutes in Suits, 130. 1888: The Origins of Orange and Blue, U.Va. Magazine (2010), http://uvamagazine.org/articles/1888_the_origins_of_orange_and_blue. Camp, Football Facts and Figures, 6-7. Ronald A. Smith, Sports and Freedom: The Rise of Big-Time College Athletics (New York: Oxford University Press, 1988), 93. Watterson III, Political Football, 558. Nelson, The Anatomy of the Game, 54. Sarah K. Fields, Female Gladiators: Gender, Law and Contact Sport in America (Chicago: University of Illinois, 2008), 36. Meyers, Unrelenting War on Football, 400-402.